Often times I will go through my cupboard and grab random jars, cans, and ingredients, laying them out on the counters; wondering what the heck is going to become of them. This particular meal was an off-shoot of one of those nights. 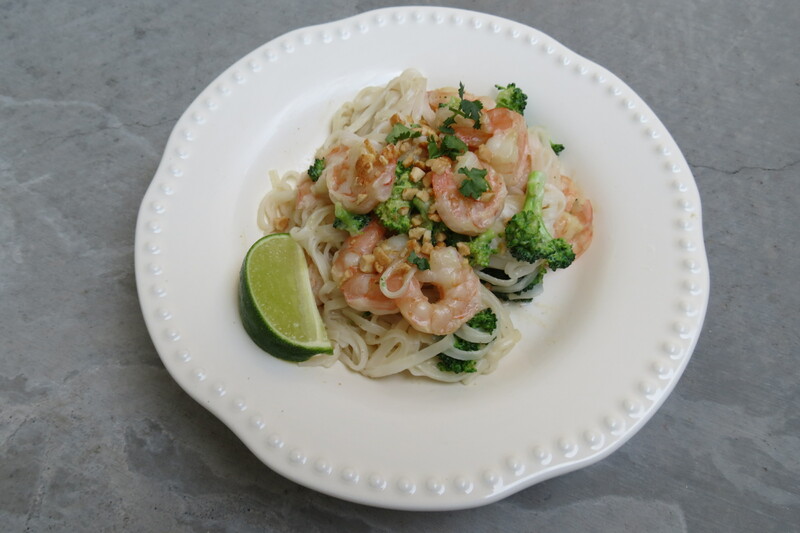 I found a package of rice noodles, defrosted some shrimp, and voila- a very basic but delicious, Asian inspired, noodle dish. I had begun making my own peanut sauce about a year ago and much to my surprise it was accepted very well by other members of this household. It’s very simple, the key being not to overcook the sauce, as it will burn and you’ll think you ruined your nice pan that you got for your wedding and you have to spend at least 25 minutes scrubbing it. Not that I’ve experienced that. Anyways, you can add any type of meat, tofu, or seafood to this recipe. I used shrimp because it is what I had on hand, but chicken has been successful as well. My peanut sauce is a little less peanut-y than what you will find in an authentic Thai restaurant; if you’d like add a smidge more peanut butter or some sweet and sour sauce. 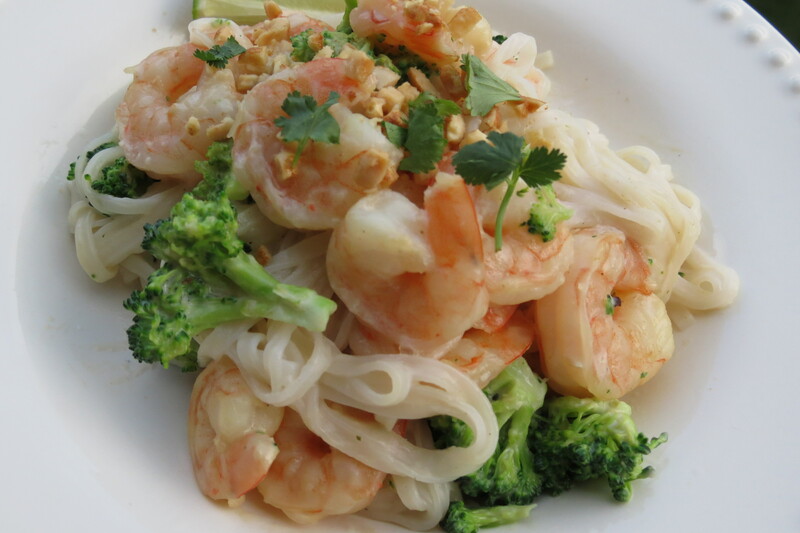 In a large sauce pan over medium high heat, toss shrimp, olive oil, and garlic. Cook for about 5 minutes, stirring often. Add ginger, chili pepper, salt, and cumin. Lower heat and let simmer for about 5 minutes. Add peanut butter, coconut milk, and juice from about half of the lime. Bring to a high heat and right before it reaches a boil, reduce to simmer. Now, cover and add broccoli, allowing to simmer in it’s own juices for about 10 minutes. Cook noodles according to package directions; I stir often for about 3-4 minutes. Drain noodles and let cool for about a minute. Then add to large saucepan and thoroughly coat with sauce. 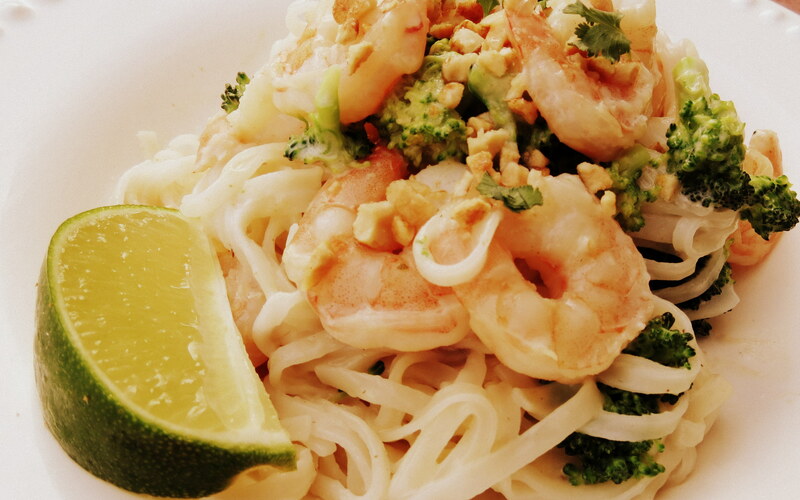 Garnish with a slice of lime and crushed peanuts and serve immediately, as it tastes the best when piping hot!